LEGO Star Wars Watch Now in Adult Sizes! Geeks Rejoice!!! 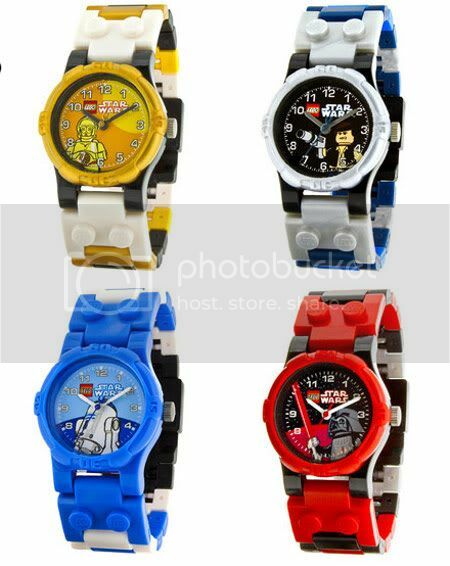 LEGO Star Wars Watches are now available in adult sizes and are priced around $20 - 30$. You can pre-order right now and expect it to arrive around April 1st. Though most of the styles are only available in kid sizes I'm sure we adults are mature enough to understand right? But when you hear that the adult watches don't come with the complimentary Star Wars minifigs that go with the kid sizes that's pushing it too far. This is totally unfair and I'm going to tell my Mommy! LEGO has finally upsized their popular line of LEGO Star Wars watches for grown-ups! LEGO fans know that LEGOs aren't just for kids anymore, so why not share your love for LEGO with one of the new larger-scale watches sporting a nearly 1.5-inch bezel and adjustable band that you don't need to take to the jeweler's to have sized -- just snap in some extra pieces or simply remove some to fit! Plastic watch case and links, with quartz movement, mineral crystal glass, and water resistant to 50 meters.